XB-6000 Class B transponder sends AIS signals, making your vessel always visible to others with AIS equipment. It receives AIS signals from AIS-equipped vessels, Aids to Navigation and portable man overboard devices and is always watching. A built-in 50 channel GPS receiver with a fast 5hz GPS update rate enables higher resolution and smoother tracking on your plotter or MFD. The XB-6000 has its own internal GPS antenna and a powerful external GPS antenna is included if it needs to be mounted where there is no clear view of the sky. The GPS is so powerful, it can be used as a GPS source for the entire NMEA 2000 network. GPS antenna with 10m (33') cable. Size: 200mm wide x 130mm high x 60mm depth (7 7/8" x 5 1/8" x 2 3/8"). Environmental: Waterproof (IP67: submersible to 1m for 30 mins). Operating temperature: -25°C to +55°C (-13°F to 131°F). Power supply: 10-32 VDC, 2.5W nominal. Number of receivers: 2 AIS, 1 DSC (time-shared). Receive sensitivity: -113 dBm (<20% PER). Number of transmitters: 1 AIS. Transmit power output: 33 dBm (2W). GPS: 50 channel with internal antenna. Supports WAAS and EGNOS. Also includes external antenna. GPS navigation rate: Selectable 1Hz or 5Hz with magnetic variation included in output. GPS sensitivity: -159dBm tracking & navigation. -142dBm acquisition (cold start). GPS accuracy: Position 2.5m CEP, SBAS 2.0m CEP. VHF antenna required: 50 ohm, max 2:1 VSWR @ 162MHz, PL259 connector. Connectivity: NMEA 2000, NMEA 0183, USB. All input NMEA 0183 sentences are repeated to the NMEA 0183 and USB outputs. Selected NMEA 2000 PGN's (heading, wind, depth, speed, temperature, and log) are translated to NMEA 0183 sentences and repeated to the NMEA 0183 and USB outputs. 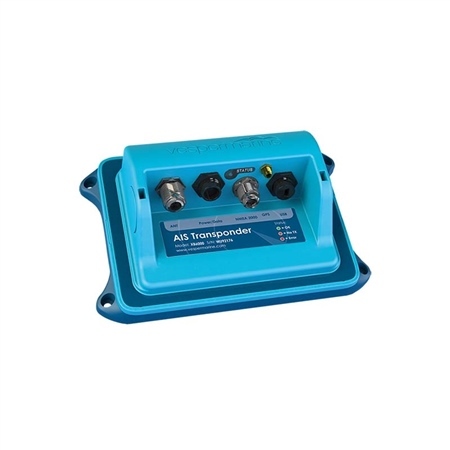 This allows a wide variety of NMEA 0183 and NMEA 2000 instruments to be interfaced and output to all other connected devices. NMEA 2000: NMEA 2000 certified. LEN 2. Micro-C male connector. Female drop cable required (not included). Compatible with all NMEA 2000 certified Raymarine SeaTalk NG devices (DeviceNet cable required), Garmin, Furuno, SimNet (NMEA 2000 adapter cable required, Navico part 24006199 or 24006413), and other NMEA 2000 certified products. Protocols: IEC 61162-1, NMEA 0183, NMEA 0183 HS. Standards: IEC 62287, IEC 60945, IEC 61108, IEC 61162, ITU-R M.1371, ITU-R M.825, ITU-R M.1084. Approvals: BSH, BABT, CE, US Coast Guard, US FCC, Industry Canada. Warranty: Two year world-wide warranty.